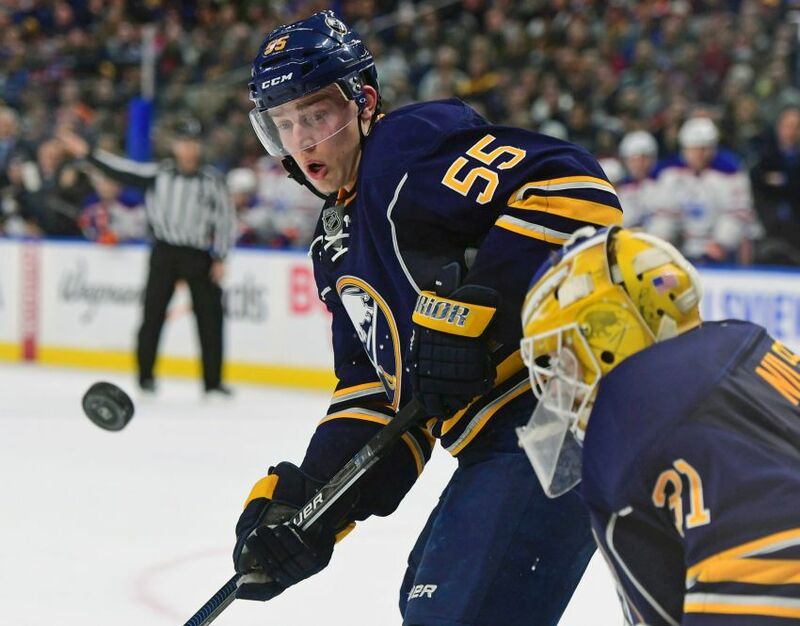 BUFFALO – The significance of defenseman Rasmus Ristolainen’s recent exploits shouldn’t be overshadowed by the Sabres’ disappointing season. In the near future, if Ristolainen becomes an NHL All-Star or garners serious Norris Trophy consideration, remember the torrid run he is enjoying entering tonight’s tilt against the Carolina Hurricanes at KeyBank Center. Ristolainen has three goals, two overtime winners and 14 points while averaging a whopping 27 minutes, 41 seconds of ice time over the last 10 games. The stretch, one of the best by a Sabres defenseman in recent memory, has vaulted Ristolainen, 22, into the elite company. “He’s starting to slide into that,” Sabres center Ryan O’Reilly said Wednesday. Consider: Ristolainen is tied for third among NHL defensemen with 23 points and 20 assists. The Finn’s average ice time of 26 minutes, 41 seconds ranks fifth among all skaters. “He’s playing with a ton of confidence with the puck and a ton of confidence moving the puck,” said Sabres coach Dan Bylsma, who noted that confidence has grown from the beginning of the season. Right now, Ristolainen leads the Sabres in assists and points. Winger Kyle Okposo, whose 13 assists rank second, is one point behind. A defenseman has never led the Sabres in scoring, although Hall of Famer Phil Housley finished second three times in his eight-year Buffalo career. After scoring a goal and two points in Tuesday’s 4-3 shootout loss in Florida, Ristolainen is on a 61-point pace. The Sabres haven’t had a 60-point defenseman since Housley scored 81 in 1989-90, a franchise record for the blue line. A defenseman hasn’t hit the 50-point mark since Garry Galley had 54 in 1995-96. Ristolainen, who usually says little about himself, hasn’t set any goals for a point total. “I just want to make it to the playoffs,” he said. The Sabres rely on Ristolainen for a huge portion of their offense. He has assisted on 31.3 percent of the goals he hasn’t scored this season, a number that trails only Edmonton’s Connor McDavid (33.3) and Ottawa’s Erik Karlsson (32.9). Like those superstars, the 6-foot-3, 201-pound Ristolainen has produced offense playing difficult minutes against the opposition’s top talent every game. Ristolainen was on similar pace last season – he had seven goals and 24 points on this date a year ago – before tailing off during the winter and finishing with nine goals and 41 points. Why could Ristolainen showcase more consistency this season? His body is better conditioned to handle the rigors of playing mega-minutes every night. “The big difference from last year, I think he’s gotten even stronger,” Kane said. “He’s a workout machine in the summertime and even during the season and builds that base for him to be able to be a strong, heavy player,” Bylsma said. Incredibly, thanks to five overtime games, Ristolainen has played 28 or more minutes in five of the last eight contests. The Sabres keep falling behind early and roaring back. Tuesday against the Panthers, they trailed 2-0 before racing back to take a 3-2 lead. The 12th-place Sabres (32 points) trail Carolina by one point in the Eastern Conference standings.